Depth Insights™ is a semi-annual scholarly journal that appears in Summer and Winter, and serves as the primary scholarly peer-reviewed depth psychology publication for the online community, Depth Psychology Alliance. All articles and essays undergo peer review and editing to meet our high standards for publication. The founder and Executive Editor is Bonnie Bright. If you would like to guest edit an issue, please contact us. Our mission is to publish well-written, high quality depth-psychology-based articles, essays, poems, and art that best illustrate how depth psychology can enhance the lives of those who engage with information and practices aimed at accessing the unconscious. Understanding the symbols and messages that that come through from the unconscious can help orient and and guide us in daily life, as well as offer insights that help us make meaning. 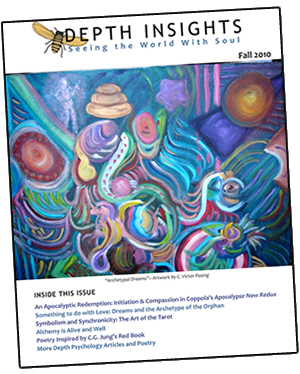 Depth Insights journal appeals to a wide audience, from those who are new to Jungian and depth psychological ideas, as well as to those who are seasoned scholars and practitioners in the field. 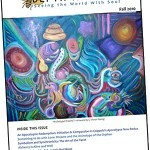 Each issue is provided as a downloadable PDF as well as a set of easy-to-navigate web pages. PLEASE CONSIDER A SMALL DONATION to help us offset the cost of evaluating submissions, reviewing and editing articles, creating the layout, and hosting and maintaining the website. Suggested donation: $10 per issue. Depth Insights™ is supported by an editorial board comprised of individuals who demonstrate scholarship and recognized expertise in Jungian and depth psychologies. Each also has a commitment to advancing depth psychology in the world. The role of the board is to provide editorial recommendations and to work in an advisory capacity to aid in the development of the Depth Insights editorial vision, policy and practices, among other tasks. Calling all scholars, writers, artists, and poets: Put your passion toward extending Depth Psychology into the world through your writing, art or poetry. Limit: 1 essay, 2 poems, 3 pieces of art per person. We consider well-written essays and articles grounded in depth psychology, focused on topics such as dreams, nature/ecopsychology, psychotherapy, pathology, trauma, archetypes, mythology, shamanism, art/art therapy, astrology, divination, and alchemy, to name a few. We especially welcome works that illustrate how depth psychology and related tenets (like those listed above) can make a difference in the world when applied to contemporary culture, social issues, mainstream media, or professional fields such as business, health care, non-profits, education, science, etc. Please use APA Style documentation for all essays/articles. See submission guidelines here.